Porcelain is your shade if you wear Pure Anada Loose Mineral Foundation in Prairie Rose, Arctic Alabaster or Northern Light. Very Fair is your shade if you wear Pure Anada Loose Mineral Foundation in Atlantic Bisque, Ivory Chinook, Prairie Rose, Arctic Alabaster or Northern Light. Light is your shade if you wear Pure Anada Loose Mineral Foundation in Sunkissed Canadian, Soft Wheat, Flaxen Field. Medium is your shade if you wear Pure Anada Loose Mineral foundation in Pacific Tan, Niagara Fawn, Amber Honey, Beige in Banff. 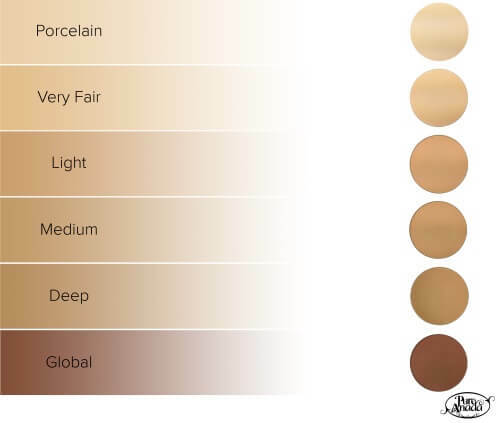 Deep is your shade if you wear Pure Anada Loose Mineral foundation in Maple Sugar, Caramel, Cappuccino. Global is your shade if you wear Pure Anada Loose Mineral foundation in Cocoa, Swiss Chocolate, Hazelnut, Ebony. 1. 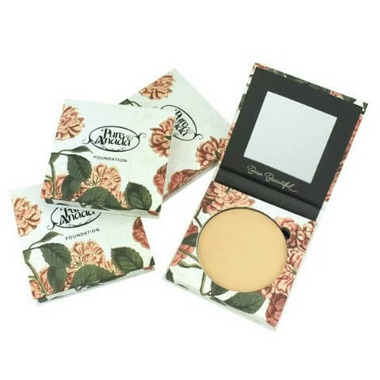 Pure Anada pressed foundation is a lightweight, matte pressed powder. 2. The coverage is sheer, with the option to build layers for more coverage. 3. Finely milled minerals (NOT nano-sized), impart flawless coverage, while organic jojoba wax provides long-lasting wear. Dosage: Apply Sheer Matte Pressed Powder on clean, moisturized skin. The best applicator for this product is the PA foundation brush. Swirl in in the powder, and gently dust in on your skin. The finish is lightweight, and sheer with the option to apply it heavier for more coverage.